One of my great daily pleasures is reading the newspaper - generally the Sydney Morning Herald in paper form, the New York Times online. On my recent holiday away, it was great fun to read the local newspapers in each district, and get a perspective on local concerns and activities through them. You can see why I chose Nieva Salabe for my latest Kiva loan. Kiva is an avenue for lending to the working poor. I first learned about it almost two years ago, and since then have done fifteen loans - some are now paid back, the rest are being paid back. When I'm repaid, I recycle the money to lend again, as well as putting in more from time to time. While I most often have chosen women who are engaged with needlework/fabric, due to my own interests, I've also lent to grow flowers in Cambodia, sell fruit and vegetables in Peru, and other things. It's a window on other worlds, and chance to make a difference through the brilliantly simple idea of microfinance. Nieva V. Salabe, 51, is making sure that her family has enough provision for their daily needs. Married to Jose Salabe Jr., a driver, they are blessed with three children. She makes sure that she helps her husband earn income so that their family can have a better life. She has been selling newspapers for many years. Nieva has been a regular member of Center for Community Transformation* (CCT) for several years now. She regularly attends their weekly fellowship meetings and pays her weekly dues consistently. Because of her good repayment performance with her previous loans, she was able to borrow 12 times from CCT’s Cooperative. She is consistent in paying her dues because she used the money she borrowed to buy more stock of different newspapers for her business. 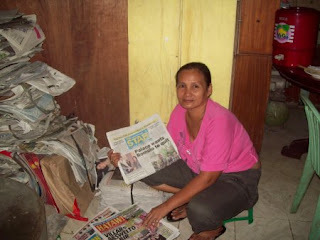 Her business lets her earn a profit of PHP 14,000 per month. Now with your help, she would like to apply for a PHP 38,000 loan. This amount will be used as a source of added capital to her expanding business by buying more newspapers to sell. She dreams that her business will continue to grow so that she can help her children achieve their ambitions in life. * All CCT community partners / clients are organized into fellowship groups that meet on a weekly basis. A fellowship group is composed of 15 to 30 community partners. The fellowship groups gather each week to study the Word of God, build social capital, and pay Micro Finance loans. It's not at all difficult to lend via Kiva - do try it. Minimum loan is $US25, plus a suggested 15% of your loan to support Kiva's own costs.